This three days residential Yuva Prerana Shibir was organized under Safal Yuva Samarth Bharat programme at Gandhinagar from 24th feb to 26th feb 2017. 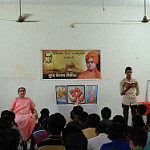 There are 49 participants (brother and sisters) colleges of Ahmedabad, Gandhinagar, Palanpur, Patan and Mehsana. The camp was inaugurated by Shibir Pramukh Shri Nalinbhai Pandya(Karnawati vibhag Pramukh). Suyanamaskar, yogasana, pranayama, discussion on various topics, lectures, bhajan and geet were the part of camp.